Sea the Stars - 2000 Guineas, Newmarket, 2009. Sea the Stars - The Derby, Epsom, 2009. Sea the Stars - Coral Eclipse, Sandown Park, 2009. 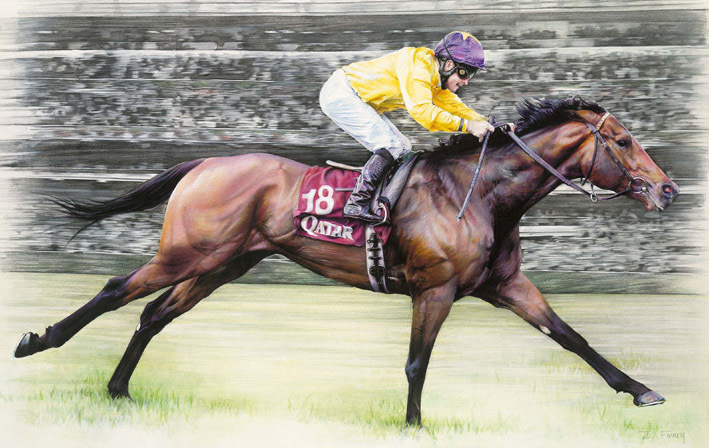 Sea the Stars - Juddmonte International, York, 2009. Sea the Stars - Irish Champion Stakes, Leopardstown, 2009. Sea The Stars the Dual English 2000 Guineas and Derby Winner, is now the best Racehorse in at least 20 years or even the last 30. The win in the Coral Eclipse at Sandown in July made him the first horse in 20 years to win a remarkable racing treble and also promoted him to the "best horse in the world for 2009". He now merits a World Thoroughbred Ranking of 131 and will improve on that. The August victory in the Juddmonte International at York broke the course record in a four runner race. During September he shocked John Oxx (his trainer) by adapting to "yielding" ground conditions at Leopardstown to win the Irish Champion Stakes. In October Sea the Stars was immortalised with the legends of flat racing when using all of his class to win the Prix de l'Arc de Triomphe after a less than easy trip around Longchamp.